September 2nd-6th – North Dakota, Minnesota, Wisconsin, Michigan – “Proceeding generally Eastward.” I dropped in at several visitor’s centers, talked with people, looked at maps, and read lots of literature. In the end however I looked at a map and decided I would head for “the place on the map where three of the Great Lakes meet”. This might not be the way most people would choose a route, but I doubt the reader would expect me to take anything but a different approach. I was keeping my greater goal in mind, “get to the far east and north as soon as possible”, but be alert enough as I pass through to notice the geography, and the things I might want to come back to see. Thus I didn’t want to just drive it all in a single shot, and not right along the wide open fastest route. 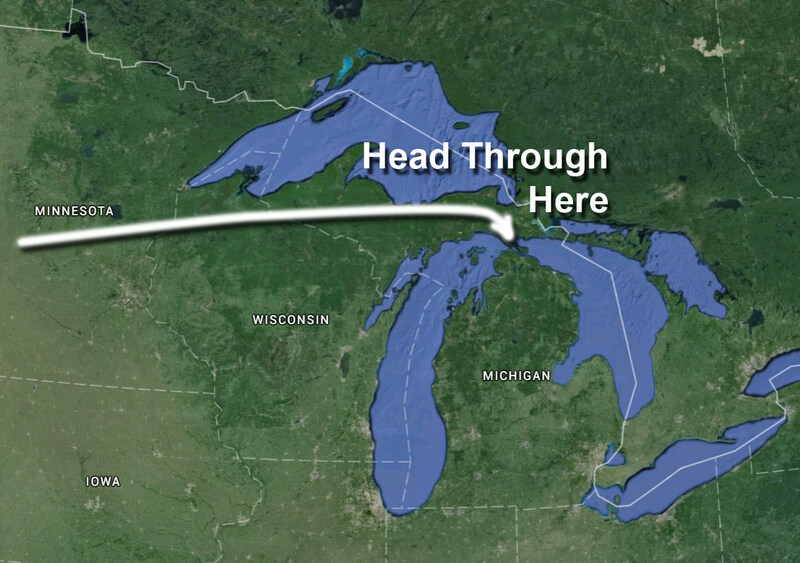 So, looking at a map you’ll see that the three western most of the Great Lakes meet in upper Michigan. 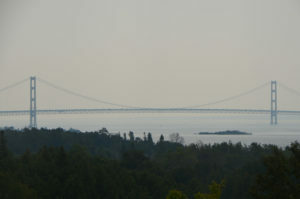 I decided I wanted to go there and drive across the bridge that connects Michigan’s Upper Peninsula area with the rest of the state. I have been across the I-90 route below this, and along Canada’s highway one above, but not through this region. So from South Dakota up to North Dakota, then over to Minnesota. Now Wisconsin ended up getting a pretty raw deal as this route goes through just the corner of it. From there into the “Upper Peninsula” of Michigan. The bridge here is the Mackinac bridge. That name may sound familiar, as Mackinac Island is a popular destination in this area. As I headed north (through South Dakota) I had a pretty strong wind mostly at my back. The road was a two lane with a pretty high speed limit that passed through a few small towns but not too many. Mostly straight and long and flat. The wind was a help and the traffic was mostly commercial trucks with some respect for the speed limits so the cruise control was a boon. Lots of farm land, amazing diversity in crops and states of growth, implements and equipment, fences, houses. I stopped along the road at a historical marker and made some breakfast. As I headed east the wind was now across my path and had a surprising slowing effect on the vehicle. The interstate had a lot fewer small up and down sections than other roads, the grade having been filled in and leveled. The Jeep is geared well to pull itself along the road, and seems to have been set up more like a muscle car, with a lot of long gaps between gears. So if it needs to drop to fourth gear and you are wanting to drive over about 65 it wants to be turning over 3K revs. While it can handle that, the mileage goes down markedly. So I was driving 65 most of the way and only doing 70-75 (speed limit) when it was really flat or downhill. Often not even then. As noted in a previous post I settled in for a shower and nice room in Jamestown ND. 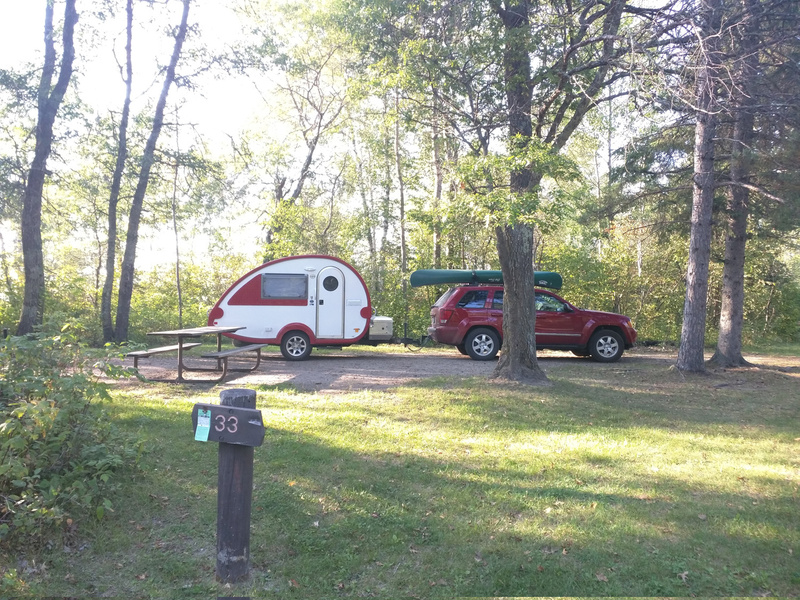 The next day I set my sights on somewhere in eastern Minnesota and ended up at a state Dept of Natural Resources camp at Mantrap Lake in the Paul Bunyon National Forest. The camp was unique in that I had 4G cell service here, so I burned up some bandwidth and uploaded a bunch of pics for the blog. I was surprised that the hosts thought that this camp wouldn’t fill entirely on Labor day, but it did have a lot of sites. No hookups here and cheap. The weather was warm, but I was in the shade and there was a light breeze, even so, no worries about power, as the sun got me charged up before I hit the road. This was a nice place to let the GPS do navigating as the roads all went between various small towns or followed some not so obvious geography. So there was typically no simple straight through route. It turns out that this is near a local scout camp and I drove over to see the gateway there, and then back out and around the roads in the area. 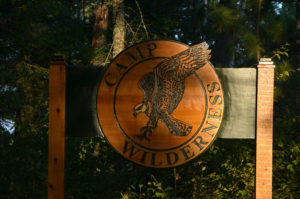 An amusing aside, this camp belongs to the Northern Lights Council of the BSA, and their web site is NLCBSA.org. My local district is North Lakes District and we have the domain NLBSA.org (no C). Before we moved the district email to Office 365 for Non-Profits, the emails were set up as “catch-all” accounts. Which means that when someone would forget the “C”, the email would show up in the district’s “info” account. Since we no longer have a catch-all account these folks just get a bounce message. Interesting coincidence my having chosen to slow down and see this camp, since I only did this one other time, in Alaska. 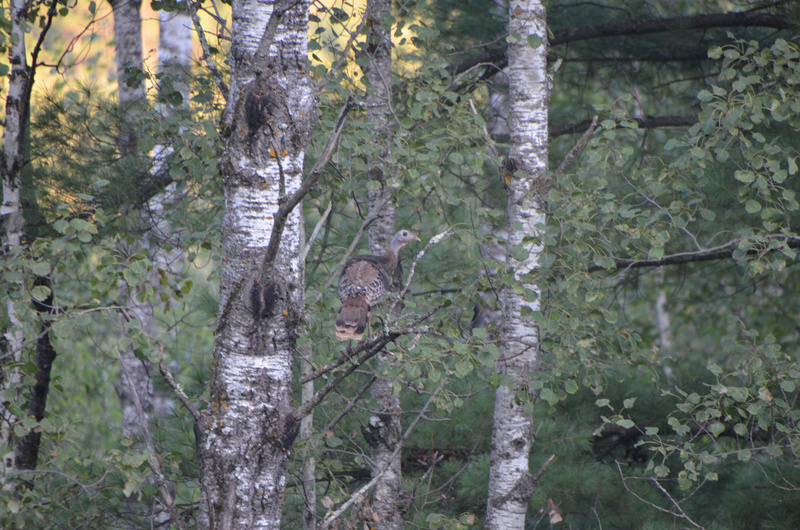 As I was driving down one road I saw about a dozen wild turkeys along the road. I slowed down to take a picture, but they all flew off as I pulled up. 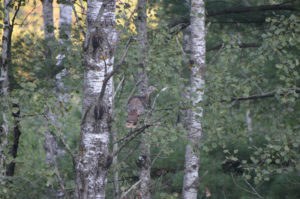 I got some blurred pics of them in flight, but a couple landed up in trees and I got this one picture of one there. The next day was the start of the Labor Day weekend, so I decided to stretch a little and try to hit my goal on Friday and not be traveling with everyone else on Saturday. 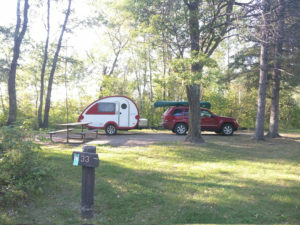 So I booked ahead at the KOA in Saint Ignace, the town at the north end of the Mackinac Bridge. It was Labor Day, so I was also worried about availability, so I booked two nights, and figured I would enjoy the day off from traveling. Had I been thinking I would have booked three nights, but all worked out in the end. 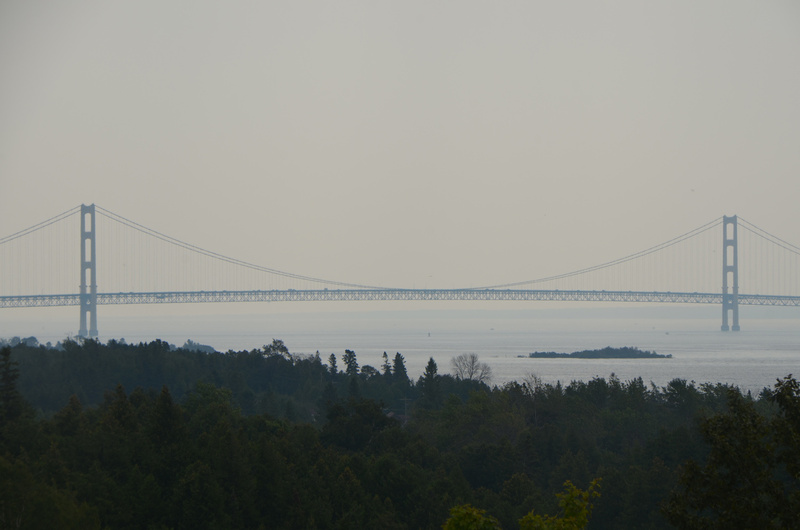 The Mackinac bridge has a small toll, so not something you would to drive over and then back just to see it, so that was going to wait until I was heading south, but I got a few pics from the shore. Now a word about travel time estimates from your favorite direction software. They apparently have no clue about speed limits along the route. This route was through more little towns than I care to count. And each one had you slowing down. So there was no way that the 561-mile trip was going to take 9 hours and 14 minutes. Just how long, I wouldn’t find out until I arrived about 14 hours later. But I got an early start and took several short breaks. I buzzed through the corner of Wisconsin in no time, so I need to come back to see Wisconsin and probably Minnesota in a little more detail. However, I did stop long enough to put my hand in Lake Superior, and later would do the same for Michigan and Huron. I enjoyed a little local driving around back-roads behind St. Ignace, but I put the trip to Mackinac Island on the list for another time. 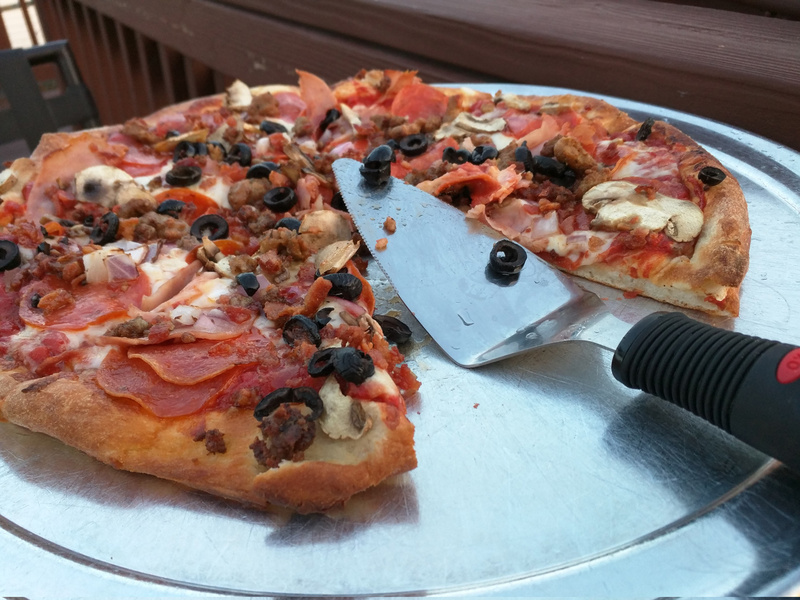 I needed a rest and some pizza. There is a BC Pizza here, small Michigan chain, pretty good pizza, I believe BC stands for “Better Choice”. I actually ended up eating here both days.